What does it take to fast track your career from Content Marketer to Vice President of Marketing in just four years? How can you turn just three people into a content marketing machine? 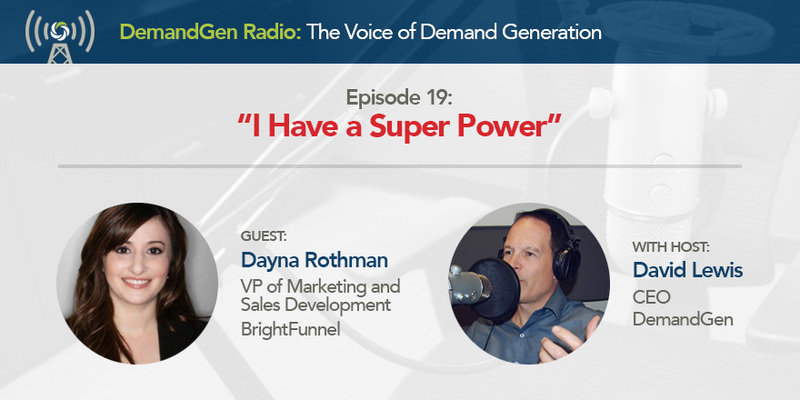 You can ask Dayna Rothman or listen to this episode of DemandGen Radio. Dayna is now VP of Marketing at BrightFunnel, and just 4 years ago she was at Marketo cranking out “lead bait” as the Senior Content Marketer under the leadership of Jon Miller. Dayna has also authored several of Marketo’s Definitive Guides, and wrote Lead Generation for Dummies published by Wiley in 2014. She’s also a content contributor to Lynda.com. It’s no surprise that this “Wonder Woman” reveals that she has a super power when it comes to content creation, which she shares with you all. But her passion for crafting modern marketing content and demand generation tools are not her only secrets for scaling the ranks of marketing. Dayna shares some sage advice for women about confidence, being fearless, speaking your mind, showing results, and having a strong work ethic. She also talks about her experience working at Marketo, her mentors, the pressure there, and what she loved most about the team.